There are undoubtedly countless examples of manufacturers that have been frustrated in their search for a service to compliment a specific area of their business; not because they could not locate what they needed, but rather that suppliers chose not to engage in one-off jobs or insisted that such work become part of a larger, more expensive contract or project. Sometimes, in the precision manufacturing sector, a client/buyer will in fact have need for a singular service only, such as the design of a specific tool or mold. However, they might not have the capability to perform this function in-house, thereby necessitating that the job be out-sourced; and since a design is their lone requirement, they do not want to incur further costs beyond that stage. Noble Precision is pleased to provide tool and mold design services to support clients with a specific need in this regard. Furthermore, our designers have extensive familiarity with the properties of a wide range of materials/coatings, thereby lending supplementary insight to the design process in terms of the actual tools/molds and the manufacturing processes/practices in which they would be applied. 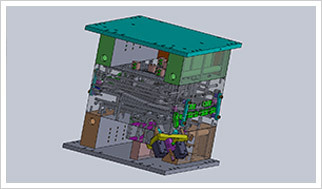 As a result, clients can confidently rely on Noble Precision to deliver tool or mold designs that will ultimately provide the precision/accuracy and performance required during the production stage. If you would like additional information on our tool and mold design services, call Noble Precision today at 416-938-6455 or contact us to request a follow-up consultation.